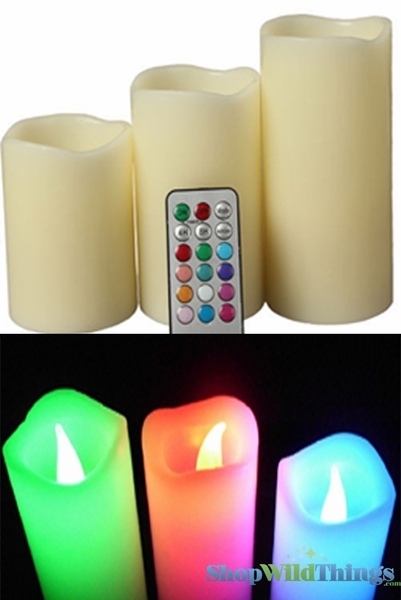 LED Flameless Color Changing Candle Set w/Remote - Ivory - You will get 3pcs : 4" tall, 5" tall and 6" tall. Each candle is 3" in diameter. The entire candle will change colors based on your color choice! You can also set it to a steady light or a function that fades in and out and flickers like true candlelight would. 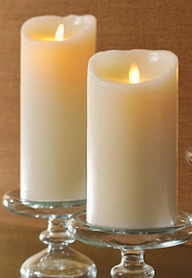 These amazing real wax candles have the appearance of gently melted edges for a realistic look. Flameless candles are safe: No flame, no mess, no wax spills, no danger. The included multi-function universal remote control works w/all the candles at once - CR2025 lithium battery included. Choose a steady glow or a flickering light with the Mode button. Press multi-color button and the light will gradually change. Each candle uses 3 AAA batteries which are not included. There is a built-in timer that you can set with the remote to run for 4 hours or 8 hours at a time. These are totally stunning and will put the wow on the table for your next party or event. LED light bulbs last for thousands of hours and stay cool to the touch, so that you can have them out anywhere and they are completely safe.